So. Socks. I knit a pair, remember? In case you were wondering, it’s no longer that green outside my windows. There’s a distinct orange tinge to everything and a chilly breeze darting around. It’s getting to be that “knitting weather” everyone is talking about. I keep seeing socks on my blog reader (SpinningWoollyYarns, for one. The Yarn Harlot, for another). I’m in a virtual sock knitting club (check out Maggs, Hannah and Paula). I just received a package of amazing sock yarn! I should be casting on in a frenzy, right? Well, I haven’t. I am stuck in knitting quagmire. 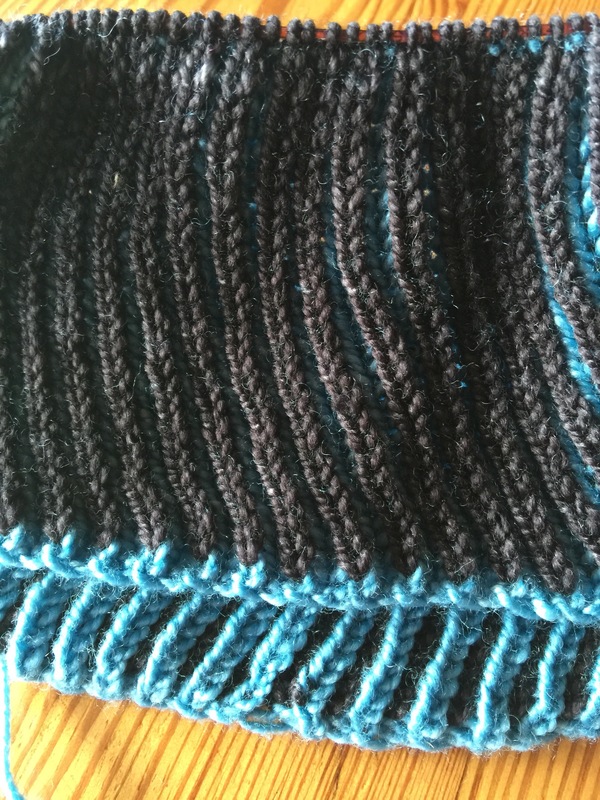 I am making decent progress on my Color Dipped Hat, but man is it slow going. Fisherman’s rib, I am learning, is wonderfully thick, squishy and stretchy. It is made that way via what is, for me, an excruciatingly slow process. Each row really only adds half the stitches (since you knit or purl into the stitch below half the time) so each physical row of knitting takes two rounds to complete. It’s slower than regular 1×1 ribbing sooo…yeah. It’s taking a long time. And, I’m past the two color portion so I don’t have as much visual interest to keep me motivated. My problem now is that, even though I got going and it’s all making sense now, I am continuing to question my yarn choice for this. It’s really more worsted than aran, and the pattern gauge is really closer to bulky, so it’s knitting up loose. It just might not be ideal for a three year old…but that said, it’s kinda pretty and would look really sweet on her with leggings. My other quagmires all have to do with either blocking, sewing on buttons or making tassels. I can’t swear that any of them will ever get done, and none is really inspiring enough to keep me going! So, in light of all that stuff going on, and the amount of Christmas knitting I’m still hoping to accomplish, and the thought that maybe someday soonish I’ll go back to work and stop having such a ridiculous abundance of time to knit, it’s been hard to give myself the liberty of casting on for a pair of socks for myself. So when Maggs suggested in her Thursday sock post to maybe put the sock club on hiatus until January, I thought that made a lot of sense. But…socks! They keep calling to me! The sock pattern I got from knittinginfrance is toe-up, and I need to knit some more socks so I’ll be ready for that! Paula is making Hermione’s Everyday Socks, and that’s the pattern I was thinking I’d do next! It’s going to be cold soon! Everyone’s knitting socks and they’re all so cool! So, screw Christmas–I’m makin’ SOCKS! I think that having a sock project on the needles is always a good idea (although I’m a bit biased as socks are my go to project) they’re great take along projects and can be good for mindless knitting too and if you’re struggling through quagmire projects you can even use them as a reward system to keep yourself motivated (I also use this for household chores). I would love for socks to be mindless knitting for me one day!! My goal is to get decent at the basics and find a recipe that consistently fits me well. Eventually that will hopefully mean they can be my constant standby. A plain sock in the middle of the foot or leg can be very relaxing, its just inches of stockinette or ribbing usually, and I use the super short circular needles so I can just keep going around and around without stopping. That sounds like a great goal to me! 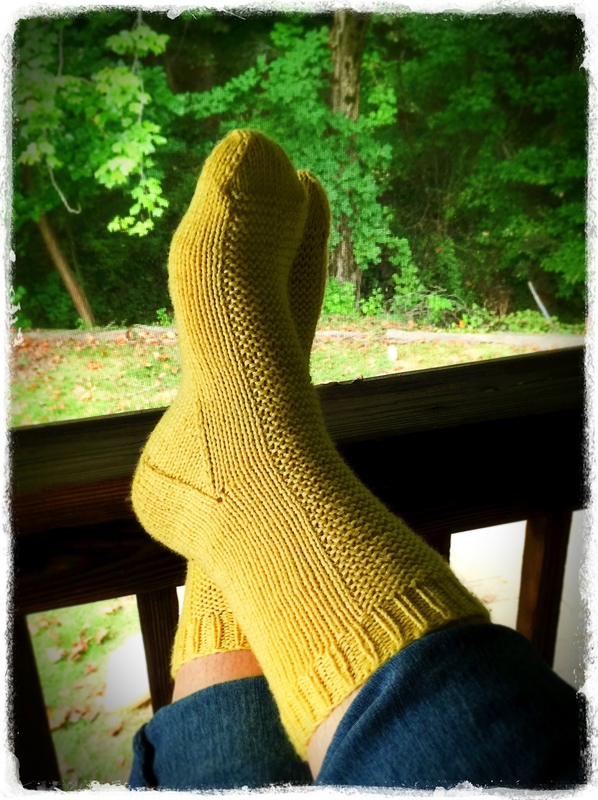 Have you read Kate Atherley’s book Custom Socks? Its fantastic for teaching you how to make socks that fit perfectly, the patterns are well written and has toe up and top down with basic and more complicated patterns for both types. It’s a great reference book as well as for patterns, I got it maybe a month ago and I’ve found it quite useful already. Yeah, I’ll get there. Some parts of the Rye socks I made got into a pretty good rhythm. I’m not a huge fan of the 9″ circs because I have pretty big hands, and I can’t get a good grip on them. But I really don’t mind dpns, so I’m fine on that front. It breaks it up a little bit, but I’ll never be able to make them faster than I can buy them anyway! I’ve heard good things about that book but haven’t checked it out yet. I’ll have to put it on my wishlist 🙂 Thanks! I have pretty small hands so maybe that’s why I like the short circulars so much then, I never thought of it that way before though. 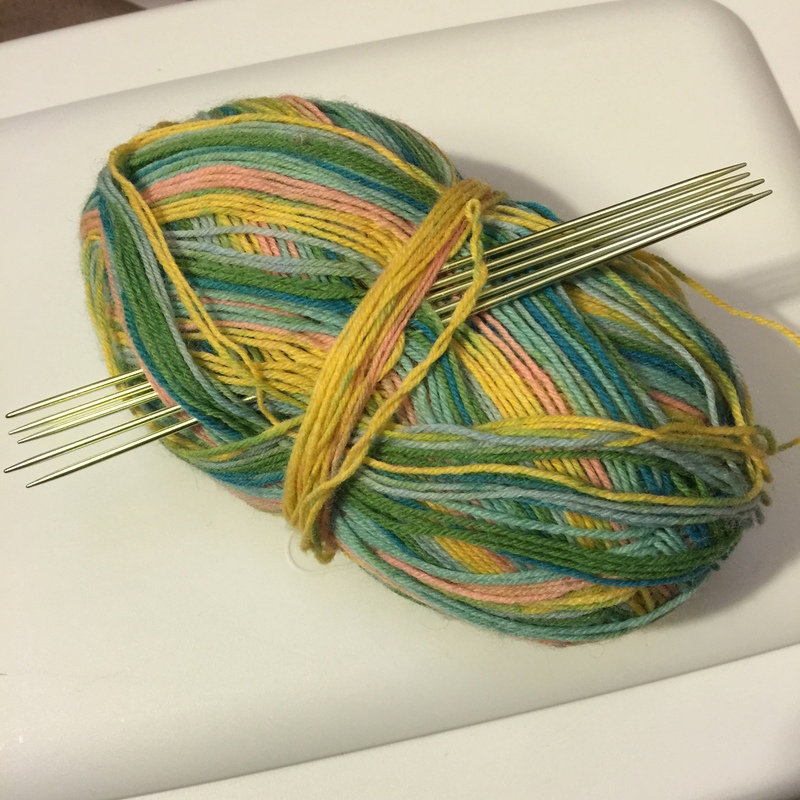 I like this sock yarn. The colors are fun. I’m SO excited for your new socks!!! I don’t think there is anything more irresistible than dome dpns and a cool skein of sock yarn! I am taking a break from post every Thursday (well officially anyway given my track record the past two weeks) but the socks are still go and hopefully there will be a November chill that they’ll be rescuing me from! 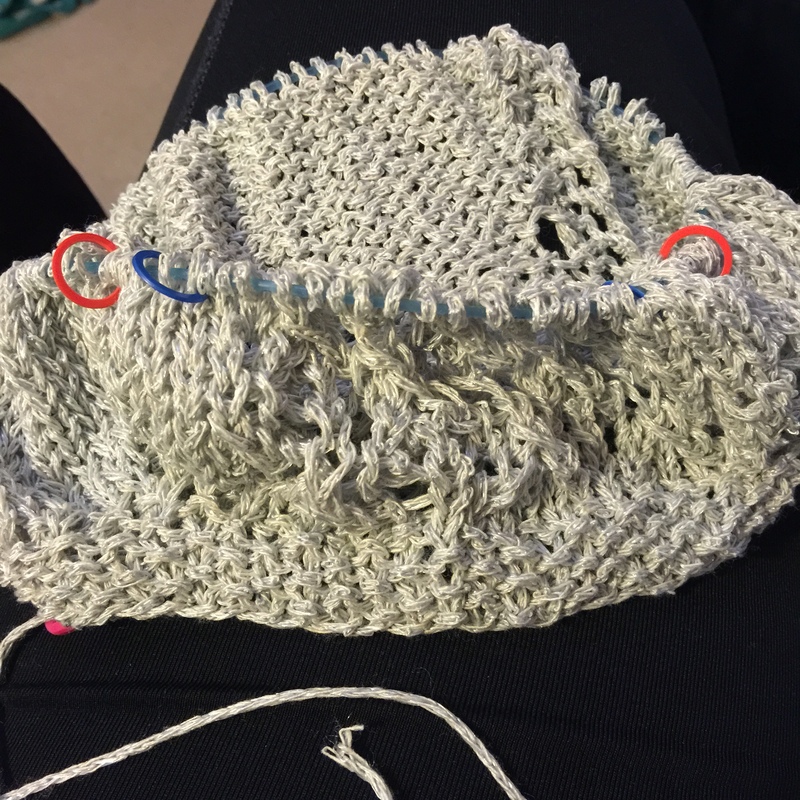 When I get back maybe we can do another live knit even! It’s funny–you’re taking a break from the Thursday posts and today is the first time I’ve actually managed to make one! I make no promises about being timely with the socks…I just want to get going on them! Thanks 🙂 I was tempted to just dive in and cast on for the Strawberry Frappuccino socks, but there’s a bunch of techniques that are new or new-ish to me and I want to tackle them one or two at a time (toe up, short rows, cables, etc. Cables aren’t new to me but I’ve never done them on a sock). So I want to practice some more first! I have not tackled cables as of yet. I did find a hat pattern today that I want to try that has them. I think I’m going to make it easy on myself and make hats for everyone that lives in cold weather and I think they will be perfect for Christmas gifts 🙂 Strawberry Frappuccino socks? They sound delicious! I’m going to search and see if I can find them!